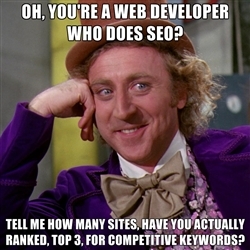 Web Developer’s doubling as SEO experts tend to be full of themselves. SEO is a full time job and is ever changing. I have dabbled in SEO and it just does not work as a part time on the side job. It’s almost, if not impossible, to run successful SEO and be a full time developer. At least in my experience.